Shoppers put in a strong showing on Thanksgiving Day and Black Friday. 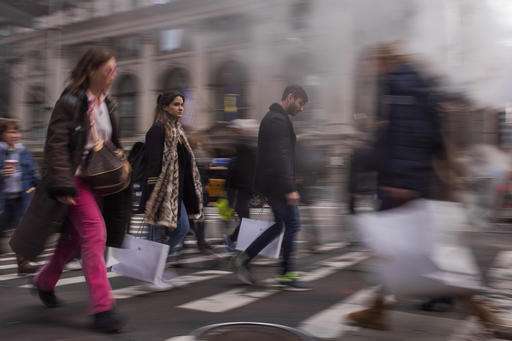 Holiday spending rose 9 percent Thursday and Friday combined, compared with the same two-day period last year, according to First Data. The bump was fueled by shoppers turning to online deals. E-commerce sales rose 10.8 percent for the two-day period, while sales at physical stores grew 8.6 percent, according to First Data, which analyzed online and in-store payments across different forms of payment cards from nearly one million merchants Thanksgiving and Friday. The data captures about 40 percent of all card transactions in the U.S. but excludes cash. The Thanksgiving weekend kicks of the holiday shopping season though stores have increasingly started their sales earlier in October. The Friday after Thanksgiving—known as Black Friday—used to unofficially mark the kickoff to door-buster sales, but now retailers are opening earlier on Thanksgiving. But while the holiday weekend has lost some of its punch, it still sets the tone for the season. "It was strong shopping," said Rishi Chhabra, vice president, information and analytics products, at First Data. "But people are shopping online more. And that trend keeps going up and up." According to First Data, almost 25 percent of the holiday dollars spent over the two-day period came from e-commerce, up from 18 percent last year and nearly 16 percent in 2014. Electronics and appliances were by far the big attractions, with the category enjoying a 26.5 percent increase in sales, fueled by shoppers' interest in TVs and other new gadgets. That compared to just a 2.3 percent increase in the year-ago period. Four of the seven categories—which also include furniture and personal-care items—that First Data tracks showed slower sales growth in stores compared with online. But when it came to electronics, shoppers preferred to buy the products in the stores for the holiday start. Electronics and appliance stores saw a nearly 28 percent sales growth, while for online, that growth was a little over 11 percent. Overall, the average dollar amount spent per person for the two-day period rose to $75.06, up from $72.84 a year ago. That figure for electronics and appliances grew by 34 percent to $163.76. But clothing and accessories stores saw shoppers on average spend $80.55, down from $81.63 a year ago amid heavy discounting. And sporting goods, hobby, books and music took more of a hit, with the average ticket size falling to $78.74 from $90.15. With early deals, how much will Cyber Monday buyers spend?